Downsizing your home to fund an income in retirement is unrealistic, according to the former Pensions minister, Steve Webb. “Hoping to live off the value of your home could be a ‘downsizing delusion’ for millions of people. Based on current Rightmove house prices, the Royal London calculated that downsizing from an average detached house, worth £310,000, to an average semi-detached house worth £197,000 then using the capital gains to buy an annuity (when coupled with the state pension), would generate annual income of £13,700. In comparison to the typical UK full-time annual wage of £27,400, the ‘downsizing plan’ would reduce a retired person’s income by 50% per annum. 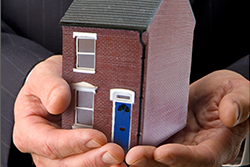 In a separate report the All-Party Parliamentary Group (APPG) – part of the House of Lords – identified that eight million people over the age of 60, living in seven million homes across the UK, were interested in downsizing. The problem highlighted was that there simply isn’t a sufficient supply of appropriate houses available to enable the downsizers to make the move. The APPG suggested that resolving the ‘right sizing’ dilemma would subsequently create opportunities for ‘second steppers’ to move up the property ladder. Across the UK, from first-time-buyers all the way up to down-sizers, the acute lack of housing stock is causing problems at every step of the property ladder. The Government’s target of creating 250,000 new homes per annum is a step in the right direction but unfortunately the actual number of new builds which stood at 142,000 in 2015, is well off the mark. So despite the warning of 'downsizing delusions', based on the current state of the market the opportunity to make the move, at least in the short term, is unlikely to be realised anyway.